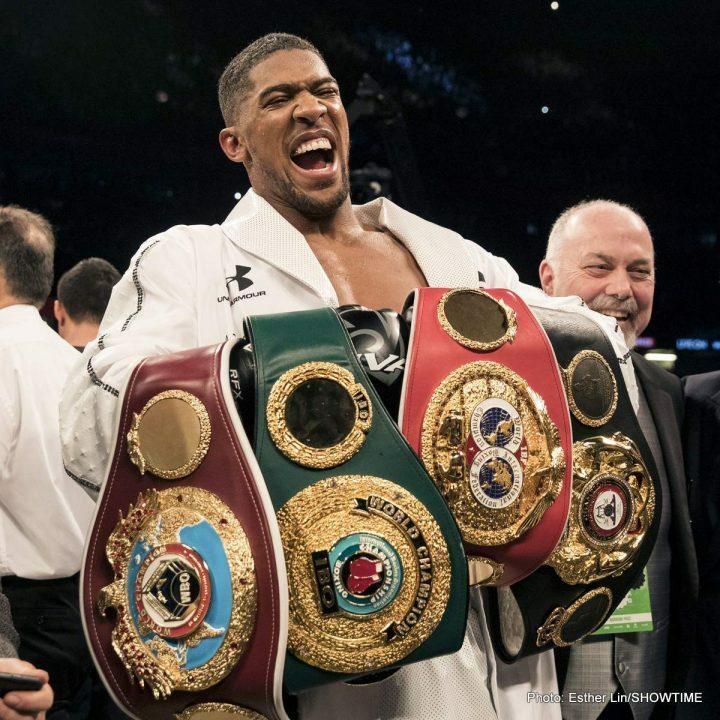 By Scott Gilfoid: Anthony Joshua has given Deontay Wilder a six-month deadline of January to sign the contract for the $15 million flat fee offer given to him for a fight on April 13, 2019 at Wembley Stadium in London, UK. Joshua (21-0, 20 KOs) has a fight that he needs to get out of the way first against his World Boxing Association mandatory challenger Alexander Povetkin (34-1, 24 KO) on September 22 at Wembley Stadium. The fight will be streamed in the U.S on DAZN, and on Sky Box Office PPV in the U.S. Although the Joshua vs. Povetkin fight isn’t PPV in the United States, boxing fans will need to subscribe to DAZN to watch it. The subscription is said to be $9.99 per month in the U.S.
Joshua’s promoter Eddie Hearn of Matchroom Boxing came up with the idea of trying to put pressure on Wilder by having Joshua sign his portion of a contract that hasn’t been agreed on by Deontay’s side for April 13. Hearn plans on having the signed contract sent to Wilder’s management for him to sign, even though it’s one that he’s already rejected. It’s obviously a grandstanding move by Joshua to show boxing public that he’s not the one holding up the Joshua-Wilder fight from taking place. Obviously it’s a little in the game to try this week move, as Wider’s team already sent a far better offer to Joshua for $50 million, which he shockingly rejected. The fans are already aware now that Joshua turned down the $50 million offer, so it’s now going to look rather pathetic hat he’s sending Wilder a flat fee $15 million offer for the same fight. Wilder has already rejected the offer that he previously agreed to, and he now wants a 50-50 split for the April 13 date. You have to wonder how Joshua’s September 22 opponent Alexander Povetkin is taking the news of AJ already sending out a signed contract to Wilder for April 13. It looks like Joshua is totally overlooking the 38-year-old Povetkin. Joshua can say that he’s no overlooking him, but it’s clear that he is. Recent Povetkin victim David Price thinks that he could be real trouble for the 6’6” Joshua due to his punching power, right hand and his ability to fight taller heavyweights. If Povetkin is able to land one of his right hands on Joshua’s chin, it could be good night for him. The unknown in the Joshua-Povetkin fight is what kind of referee that will be picked out for the fight. The last one that worked Joshua’s fight against former WBO heavyweight champion Joseph Parker on March 31 seemed to be helping Joshua by preventing in fighting. It looked incredibly bad from an outsider’s perspective. Parker literally was unable to work on the inside without the referee pulling him apart from Joshua. It worked in Joshua’s favor, as he was able to use his long reach o dominate the shorter Parker. When Parker would work his way to the inside after eating shots from the outside, the referee would pull him apart. It looked very, very odd. It one point in the fight, Joshua called his own timeout without even asking he referee. Joshua simply turned around and walked to his corner for tape repair. If the same type of referee works the Joshua-Povetkin fight on September 22, then Povetkin will likely have no chance at all of winning the fight. It’s potentially a bad situation for Povetkin in having to fight Joshua in the UK instead of in a neutral venue. The good news for Povetkin is a lot of boxing fans will see his fight with Joshua on September 22, and they’ll be able to make up their own minds about whether he was given fair treatment or not. Parker obviously got the short end of the stick in his fight with Joshua. Will the same thing happen to Povetkin? We’ll have to see. Well, I don’t think the Joshua vs. Wilder fight was going to happen regardless of how much time that was given. With the take it or leave it $15 million flat fee offer, it was given that the Wilder fight was not going to happen in September of this year. They could have negotiated that fight for another three months, it wasn’t going to happen. Joshua and Hearn needed to sweeten the offer if they wanted to get Wilder to sign the contract, and that obviously going to happen. Hearn says that Wilder was being offered 30 to 35 percent of the pot for the fight. Of course, this is just guesswork on Hearn’s part, as he doesn’t know how much revenue the Joshua vs. Wilder fight will ultimately take in. If it brings in far more than Hearn’s conservative predictions, then guess what? Joshua will make a killing. Wilder would need to be happy with the $15 million flat fee. Hearn missed his opportunity to sign Wilder for the Joshua fight when he failed to stick it out and complete the negotiations for September. Wilder had already agreed to the flat fee of $15 million for the fight, but Hearn chose to have Joshua fight Povetkin instead. It’s was a huge blunder on Hearn’s part in electing not to stick it out with the Wilder negotiations, but perhaps he never had any true intention of making the fight. This might have been all useless exercise to make Joshua’s boxing fans think that he was trying the fight together against Wilder. It looks good to some fans, who applaud Hearn’s efforts to try and put the Joshua-Wilder fight together. On the other side, a lot of boxing fans think Hearn never wanted to make the fight with Wilder in the first place, which is why he wasn’t offered a percentage split for the fight and not given a date or a location for where it would take place. Certainly Joshua turning down a $50 million offer for the Wilder fight gives one a big hint how little he wanted the fight. It looks to them that Joshua just didn’t fancy the fight. He preferred to face the shorter 6’2” Povetkin instead of the 6’7” Wilder, who has the reach and the height to reach his chin. During Tuesday’s news conference, Hearn seemed to be setting the table for a Joshua vs. Jarrell ‘Big Baby’ Miller fight for April 13. Joshua and Miller, who Hearn is said to be in negotiations to sign to a co-promotional deal, got in each other’s faces and talked trash. Hearn got excited afterwards about the potential of matching Joshua against Miller on April 13, saying, ”A lot of people will call for it no.” As of Wednesday, few boxing fans are calling for a Joshua vs. Miller fight. Hearn can say they are, but the reality is they’re not. Miller will be fighting on October 6. His opponent is rumored to be former heavyweight world title challenger Artur Szpilka (21-3, 15 KOs), who recently knocked out badly by Adam Kownacki and Deontay Wilder. Szpilka did win his last fight in beating 43-year-old Dominick Guinn last May, but that was mismatch against an old timer. Just what Miller stands to gain by fighting Szpilka is unclear. The knowledgeable boxing fans are going to see it as another case of Miller facing a hopeless opponent that stands no chance of beating him. The fans have already seen Miller matched against weak opposition in Mariusz Wach, Johann Duhaupas and Gerald Washington. The fans were hoping that Miller would step it up by facing former heavyweight world title challenger Kubrat Pulev in an International Boxing Federation title eliminator, but Miller chose not to take the fight. That was a weak move on Miller’s part, but perhaps he didn’t like his chances of winning. Miller looked terrible in his recent fight against Duhaupas. Miller looked sluggish, slow and tired against the older but more fit 37-year-old Duhaupas. The way that Miller fought against Duhaupas, he would have likely been beaten soundly had he been inside the ring with Pulev. Hearn’s desire to match Joshua against Miller seems to be one to get his fighter a sure thing win over a vulnerable heavyweight who will do most of the work selling the fight to the U.S boxing public by giving interviews and doing a lot of trash talking. Joshua vs. Miller will likely be shown on regular DAZN and not on PPV, as the American fans will probably be averse to the idea of paying to see this fight.